It’s been a few days since I wrote my last blog post. You might be thinking that I got lazy or because I lost interest. Fear not! The real reason is I’ve been working on creating my own podcast so that I could share it with you. Just to be clear – I’ve never done a podcast before and to be truthful, I never thought I would. But reading Tris Hussey’s book about blogging brought my inner geek out and I just had to try it. So try it I did. A decent microphone. I used a cheap one and the result sounded awful. I went out and bought the Vengeance 1500 microphone instead. It cost me roughly $100. Well…technically you’ll need to download some software but we’ll get to that in a second. The first thing you want to do is download Audacity. It’s completely free. Along with Audacity, you need to download Lame so that you can convert the file later. Below you can see a screenshot of what Audacity looks like once its been fired up. If you ever want to convert the podcast into a video like I did below, you’ll also need to download Windows Movie Maker. Make sure your microphone is plugged in; fire up Audacity and check to make sure that the program recognizes your microphone. You can see my microphone in the upper section of the screenshot, just above the numbers. In the upper left hand portion of the screenshot, you can see the familiar play, stop, pause and record buttons. You can record your voice by simply hitting the record button and away you go. After I’d finished creating my podcast, I wanted to listen to it. I put on my trusty headphones but no matter how many times I hit play, no sound came through. I took the headphones off and followed the cord to the computer. The cord ended on my desk. I’d put on the old headphones like a knob. Note to reader: If you replace your old, crappy headphones with better ones, don’t try to listen to your newly made podcast through the unplugged piece of crap headphones. Try the newer, plugged in ones. It will work wonders for you. 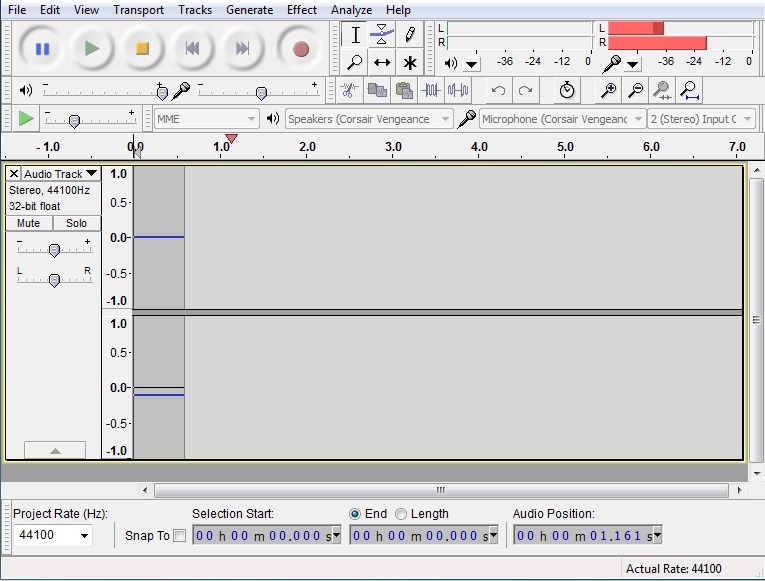 Once you’ve successfully recorded your voice, you can edit it using the myriad of features Audacity offers. For the podcast I made, I snipped a few dead spaces and added the music in the background. To add the music, you go to ‘file’ then ‘import’ and it will ask you to import a file from your computer. If you want to make the music in the background lower in volume than your voice, then you can click ‘view’ and then ‘mixer board’. If you want to clip dead air, then you highlight the part of the track (with the wavy lines) that you want to edit out and then hit the ‘cut’ button up top. The ‘effect’ command at the top will allow you to fade the music (or whatever else) in or out. I used it to fade the music in the background out in my simple podcast. Once you’ve created your masterpiece, you’ll want to save it and then change it into an MP3 file. If you simply save it, Audacity will save it as an Audacity file, which is useless for anything except editing your existing podcast using Audacity. If you want to save it as an MP3 file (or other form of file) you have to click ‘file’ and then ‘export’. You should get a dropdown menu that allows you to choose the file type you’d like to save it in. YouTube won’t allow you to simply upload a music file and that’s where the Windows Movie Maker comes into play. It’s pretty easy to use (and free) and you can upload your MP3 file into WMM and add a picture of some sort like I did. Then you save it as either an MP4 or a WMV file, which will allow you to upload your work to YouTube. You also want to make sure that the picture(s) you use stay up for as long as your podcast is running. You can sync your images with your audio using WMV. I went this route because I could easily share it with you via my blog and because I wanted to geek out some more. I’m not sure where you can host a podcast for free either. YouTube is free and probably reaches a wider audience anyways. That’s how I created the podcast (video podcast) you see below. It was a lot of fun to try and figure out and I’ll probably be playing around with it some more in the future. You can see that Audacity gives you a ton of options and I’ve only scratched the surface. However, if you’re looking to create your own podcast in the future – simple is good. You can always play with it on your own and unlock the secrets of podcasting for yourself.